Cover by Sonia (Marx Dormoy) - Mind the blog! The document is a cover of a book. This cover is in black and white. 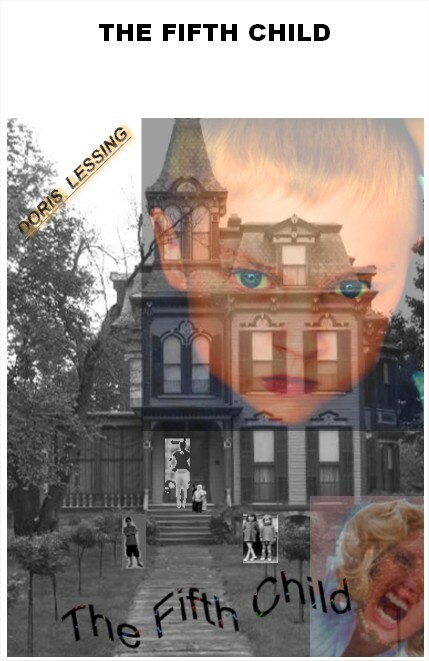 The book is entitled The Fifth Child and written by Doris Lessing. It was published in 1988. The book deals with a family. Harriet and David meet each other on an office party. Months ago they were married. They want a big house and a big family. They bought their house, they make their children but the fifth child is very different from the others. At first, their life is perfect but with Ben's birth their life changed, so this family who was living aperfect life becomes a torn family. Their dream finally became a nightmare. In the top left-hand corner, there is the name of the writer who is called Doris Lessing. The letters of her name are black and the reflection is orange. At the bottom, there is the title of the novel that is entitled The Fifth Child. The letters of the title are black; inside the letters we can see vivid colors. In the background, we can see a Victorian mansion in black and white. In the middle, we can see five characters. There are a man, a baby, a young boy and two little girls. On the left and on the right, there are trees. In the foreground, we can see a child. His face is in color. He looks angry, as an evil. In the top right-hand corner, we can see a woman. Her face is in color too. She looks very angry and depressed. We can deduce that the characters in the middle are David, Paul, Luke, Helen and Jane. The mansion is their "kingdom". We can also deduce that the faces in color are Harriet and Ben, the main characters of the novel. The background is in black and white but the title, the name of the writer and the two faces are in color in order to emphasize them. According to me, this cover is realistic with the story because the characters in the middle are transparent in the story while Harriet and Ben are the two important characters. I think that Sonia's cover is interesting because to my mind this is a good way to illustrate the story of The fifth child. On the foreground we can see the head of a young boy who could be compared to Ben. Besides we can notice the fact that this head is at the top of the cover that is to say in front of the attic ( and in the story we know that this room will be very important for the children's games and especially for Ben). Under the head of the child we can see a woman who is shouting and who could embody Harriet. We can see that the mansion and the other characters are in the background and in black and white, whereas "Harriet" and "Ben" are in colours. So it could be a way to emphasize them. To finish I think that the idea of threatening is very present here and this is the reason why I think that this cover is efficient. I think this cover is a good representation of the story The fifth child! In fact, there are many details like the house in first which is distressing. Moreover, the head of the baby in the foregroung make us embarassed and uncomfortable because is looking at us angrily. THis is like in the book because Ben is bizard and make the other caracters ill-at-ease. Besides, the woman in the bottom left-hand corner is frightened like Harriet ! According to me, this cover represents very well the atmosphere of the book after Ben's born that's why it's a good cover ! !